Iced, sprinkled and lovingly personalized ... 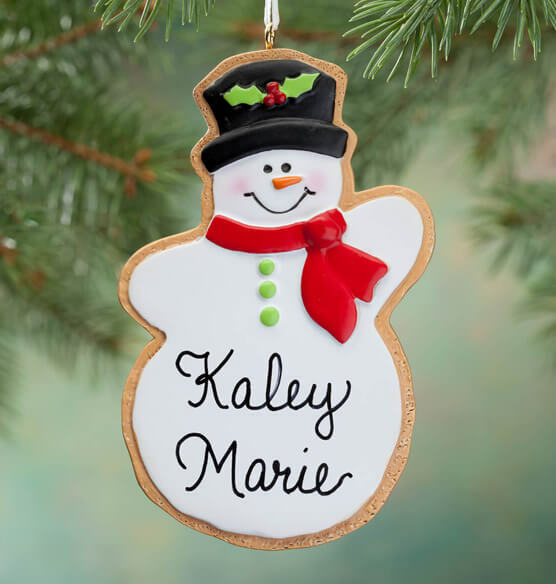 This personalized snowman Christmas cookie ornament makes the “cut” on our list of favorite gifts! We’ll personalize. Specify name, date or message on custom Christmas ornament; limit 2 lines, 12 letters/spaces each. Resin. 3 1/4" long x 4" wide. This ornament is very cute, not too big or heavy, as I have a small tree.Love It!!! The detailing was right on! I had it personalized for my 14 month old granddaughter to represent something she likes at this age in 2016. Next year, I plan to choose another ornament to represent her interest in 2017. Very attractive and having the name and the year on it will be treasured forever -- a keeper.